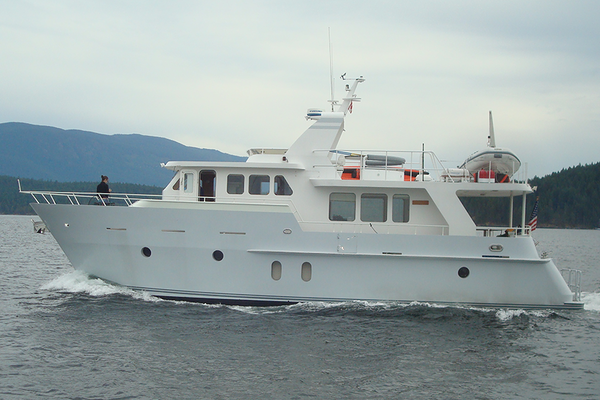 This 2001 model Grand Banks 46 Classic, RUMAWAY is meticulously maintained by her current owner. The boat shows in fantastic condition from the flybridge to the engine room and everywhere in between. She is a two-stateroom, two-head layout with galley down. The large walkaround and spacious flybridge makes it an easy cruising and entertaining platform. The teak woodwork and parquet wood sole display Grand Banks character and quality found on this yacht. She is complete with Naiad Multisea II Marine Stabilizer system and a 300 GPD Spectra Watermaker. With her low hour CAT 3208's she is truly turn-key and ready for your next cruise! 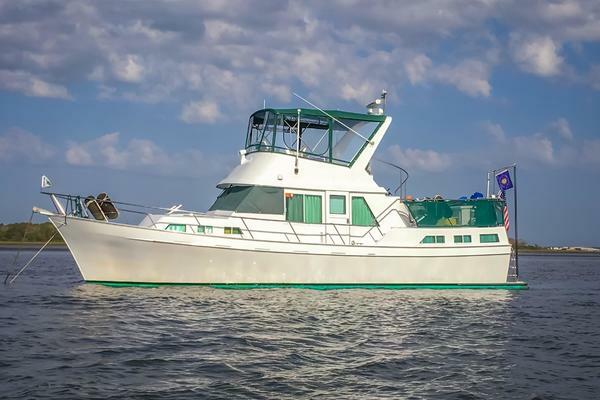 West Florida Yachts would love to guide you through a personal showing of this 46' Grand Banks 46 Classic 2001. This yacht for sale is located in Islamorada, Florida and priced at $449,000. For a showing please contact us by filling out the form on this page and we will get back to you shortly! Enter through the starboard side door by the lower helm to a wide forward facing double bench seat at the helm. Look aft to a large L-shaped settee, with easy lifting cushions for storage, with inlay teak table. Two barrel chairs sit port side with a TV in between that really ties the salon together. Continuing aft down three steps is the full beam master stateroom. She features a queen walkaround berth with desk to port, lots of counter space and storage. There is an en suite head and separate stall shower. There is also outside access to the main deck from the master stateroom. Continuing back up to the salon, looking forward, there is a breakfast bar with two stools which look over the down galley on the port side. Take the three steps down to get to the U-shaped galley which features plentiful storage, fridge, freezer, cooktop and convention oven. The guest / day head is across from the galley on the starboard side. The guest stateroom is forward with a large berth. Covers for railing, windows, tender, etc. The private Master Stateroom is aft with ensuite head. The private Guest Stateroom is forward. The laundry area is in the guest stateroom to starboard and features a stackable washer and dryer.